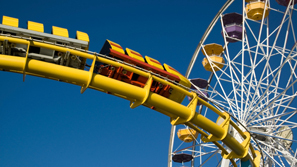 Amusement park accidents cause hundreds of serious injuries and a number of deaths every year. Whether because of negligence, design defects, or operator error, what should have been a day of family fun can often turn into a day in the emergency room and many months of recovery. Theme park accidents or amusement park ride accidents can involve mechanical failures, improper maintenance, impaired or poorly trained ride operators, and even behavior by other people who do not follow posted warnings or safety guidelines. If you or a loved one has suffered an amusement park injury or death, you may be able to recover your medical expenses, lost wages, pain and suffering, and other potential damages from the amusement park operator, the manufacturer of the ride in question, or other involved parties. The attorneys at The Law Offices of Frank L. Branson are recognized leaders in lawsuits related to amusement park ride accidents and theme park accidents. Our use of cutting-edge video and multi-media technology to build demonstrative evidence allows jurors to see and hear exactly what happened in an amusement park injury or death. To learn more about our experience in amusement park accident related matters, we invite you to contact the firm here.